Oracle ERP Cloud Review: "Intuitive enterprise resource planning (ERP) platform for all organizations"
Oracle ERP Cloud is an innovative business software that is designed for use in all businesses irrespective of their size. Its cloud based and built and designed with modern business thinking where it amplifies, enables and streamlines all operations in a business. We use Oracle ERP Cloud in our company due to its simplicity and applicability in a number of business areas such as revenue management, accounting, project management, procurement and financial reporting among others areas and functions. The software has helped us a lot in managing our operations, lowering our operation costs, improving our workflows, ensuring financial accountability and helping us realize economies of scale and beat competition from our rivals. Offers cutting-edge financial reporting through its Financials Cloud ensuring accurate financial reporting and management. Enables comprehensive management of project and portfolios in their complete life-cycle hence ensuring efficiency and success. Its not that highly customizable. The monthly charges are a bit high as they are payable monthly/user. Poor internet connections impedes on how it works making it slow and sluggish. Its very hard to find scenarios where Oracle ERP Cloud is less appropriate since from what I have observed in our company, it impacts almost every area and department in our company. There are a number of scenarios where it fits perfectly in our company such as the procurement cloud where using the Procurement Cloud module where through this tool we are able to collaborate and work efficiently with our suppliers, manage supplier risk and execute practical and sound procurement policies that are not a detriment to our company. Its also enables us to manage and track our projects easily hence become an important tool in our progress as a company. Oracle ERP Cloud Review: "The pinnacle of your construction programs"
We use the Oracle cloud for a variety of reasons. I find the most useful is "ERP Analytics". This program has allowed us to develop very meticulous reports and provide visual aids for big data problems. Working in engineering and having a large array of techniques for our civil engineering has created an issue when trying to sort data into applicable metrics. With the use of this asset we have found a comfortable reporting scheme that can be used by project controls, estimating, and engineering. This product is used specifically by our company. I can't confidently say that everyone uses it but the reports are definitely used company wide. In addition the Financials cloud has worked wonders for creating visualizations for monthly and quarterly presentations. Regardless of how vague or detailed you need your reports to be, these systems allow you to streamline your financial business processes and technologies. Imagine taking thousand of cells of data and having an algorithm find, separate, and explore trends between data. It's a project control team's dream. I can say with specifics that two Oracle Financial Cloud's trends have immediately changed how we do things in the field. Discarding an inefficient method for one that has become apparently more effective and cost saving. All-in-all the programs pay for themselves. Oracle allows immediate integration of our financial data and allows us to compare cost performance with revenue. The cloud allows various views of the same data. Something extremely helpful for executives for different needs on what they want their final presentation to be. Some like spreadsheets with as much data as possible, and some like having everything tied into one 3-d graph. All these options are viable at the click of a button with Oracle's cloud. The best part about this product is accessibility. Having multiple job sites and multiple meetings can be cumbersome when you have executives constantly moving around. These programs allows access and presentation from a centralized format, something that can never be overlooked. This may be my own ignorance, but I've found that trying to teach less computer savvy people these programs is difficult. It's definitely a powerful program/storage solution, but we have yet to be able to integrate everyone as the interface seems like too much detail for them. So buyer beware. If I'm being honest, a large con for me was the cost. Our company pays a lot of money for these programs and luckily we utilize it but I would warn that anyone who embarks on this journey, truly use it to its capabilities, not just as a cloud based excel program. For my company specifically, The ROI module as become the least used tool we have. I wouldn't say there's anything too specific that turns us off of it, but we have other methods and these ROI calculations do not account for some of our contract styles, specifically PPPs. Whenever you're giving a presentations on something as difficult as financial data, we always find the financials module to be extraordinarily useful. Being able to organize large data, have the metrics calculated and representation in multiple formats is a life-saver. When it comes to actual scenarios, it becomes difficult to assign erroneous numbers to run out other scenarios. An example would be if you wanted to run a different production rate, or various production rates to see the cost impact. I've yet to find a module that can support this. Oracle ERP Cloud: "Oracle ERP Review"
Control accounts can be posted to by any subledger. For example, Fixed Asset control accounts can be posted to directly by Accounts Receivable, if someone wanted to. Restricting the control accounts to the necessary subledgers would be very helpful. Some processes are inconsistent in the manner in which they post. For example, if a revaluation job is run a 2nd time in a period you are required to manually reverse the 1st job. By comparison, if you run the translation job a second time in a period you don't have to reverse the first job. Confusion about whether a process should be in ERP or in FCCS. Moving from an on-premise system for a large company is a hard position. Careful planning is needed to accommodate all of the existing customizations as a company moves to the cloud. The more customizations the higher the change management process. Oracle ERP Cloud Review: "Just starting the journey - but excited to go on it"
We are currently implementing. We will be supporting the finance functions with Oracle Cloud - starting with Core Finance across 21 properties in the US. Full line of end to end products -- the ability for us to have insight from the beginning to the end of whole processes versus having to look at separate systems. Established best practices in the system. Using best practices built in by Oracle is a plus versus having too much customization flexibility. "Oracle ERP Cloud - A must cloud strategy platform"
Review: "Oracle ERP Cloud, an all inclusive cloud solution to run your business"
Oracle ERP Cloud is our only accounting solution currently and it supports right now 12 different legal entities which we administer as a parent company. We have simplified all the administrative work of the different legal entities by unifying everything under the same roof. It has solved a lot of issues since we are using Oracle Best Practices for our company processes. And it has simplified IT support because it is a software as a service solution so we do not have to maintain the database or the servers for this application. It has enabled users the ability to work from anywhere they have Internet. And we sleep well at night knowing our data is secure and backed up in Oracle's data center. Process simplification since it allows for users to simplify repetitive tasks and make better use of their time. It integrates with all our other systems so that moving data between the systems is easier and helps us mitigate data entry in various systems. Their cloud service has been up 99% of the time for us and that is more than what we could say for our past systems. It has allowed us to do consolidated reporting between our legal entities. Sometimes response from the web forms could be faster. Support is sometimes a little slow solving our issues. Patching bugs is slower than I would like. It is very suited to medium and big businesses that want to have a robust accounting system that will meet all their needs. Also companies that manage more than one legal entity and want to do consolidated reporting and inter organization accounting. It is less suited for small businesses because of pricing and also because it will have a lot of functionality that will be lost in those cases in smaller businesses do not need those. It is used within the organization to help in the organization between teams and project groups. It is a reliable service, everybody likes the fact that is such a friendly user program and allows real time updates. I recommend the use of Oracle ERP Cloud and the customer support has been excellent so far. We use this product to communicate real time data through the planning, manufacturing, and logistics department. Great customer service besides being very intuitive to use, it is easy to find answers for questions about the program. Global presence -Branches of the company in the US as well as international branches are able to use and communicate in the same software. Ongoing updates fixing and improving the software. Limited customization, it is hard to configure to be the way we want to be at our company. Limited product suites. With the increase of applications, it seems they should be bundled all together without need of upgrades. 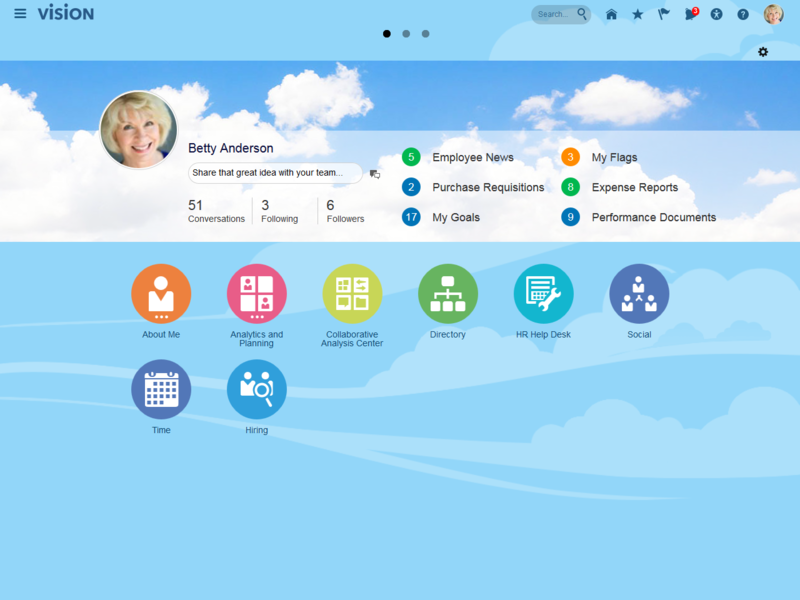 Oracle ERP Cloud Review: "Great Look and Feel!!" we are in the process to implement Oracle Cloud in the Fuel Division at FEMSA and move from EBS Oracle application. Oracle ERP Cloud Review: "Be on Cloud 9 with Oracle Cloud ERP"
Currently, we are using Oracle Cloud for sourcing events, contract negotiations, contract management, self-services requisitions, purchase orders, and AP/GL processes. Currently, this is being utilized across our organization as a single self-service procurement tool. This allows our business owners take more responsibility in their spend process. By truly having self-service, businesses can follow their spend from contract to procurement to payment. Although this allows our business to see the whole process, we still have encountered areas that wish to not take ownership. Allows user to see the full process of procurement from start to finish. Intuitive program for end users to navigate the process. Great for transitioning users to self service business model. OTBI reporting could be more intuitive. Hard for users to create custom queries/reports. Round trip punch out for vendors could be more customizable by end users, edit requisitions. Full spectrum of the process within one screen. For instance, see an invoice is on hold and the reason from the requisition life cycle. It provides a one-stop shop for end users to see their requisition, PO, and payment details from one screen. Users now can review information and take action to move the process along to the next step, either receiving, invoicing, payment, etc. Need to provide the spreadsheet upload functionality for all configurations. So it is more time saving and more clients will move to Oracle Cloud. Provide at least two standard balance sheet and income statement formats, as they will be used by every client. Rapid implementation spreadsheets should have support for creating multiple ledgers at time, even if different currencies are being used for a specific country. Currently it supports only one ledger per country based on currency. It is very easy to maintain, and the biggest advantage is spreadsheet uploads and invoice imaging scan solutions in AP. 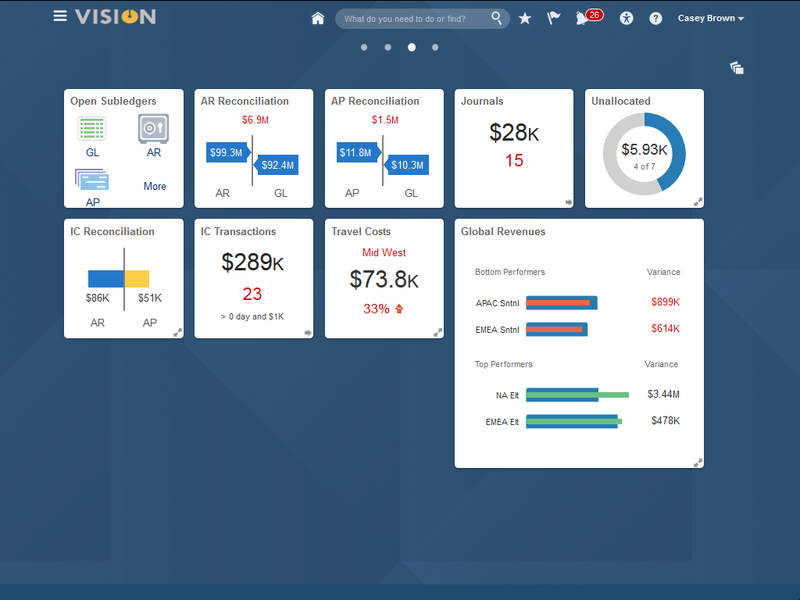 Oracle ERP Cloud Review: "ERP FUSION"
We are using Oracle Financials to support business operations and street reporting. Oracle ERP Cloud is well suited for all medium to large organisations because of process standardisation, availability, ease of use, rapid implementation and intuitive configuration. 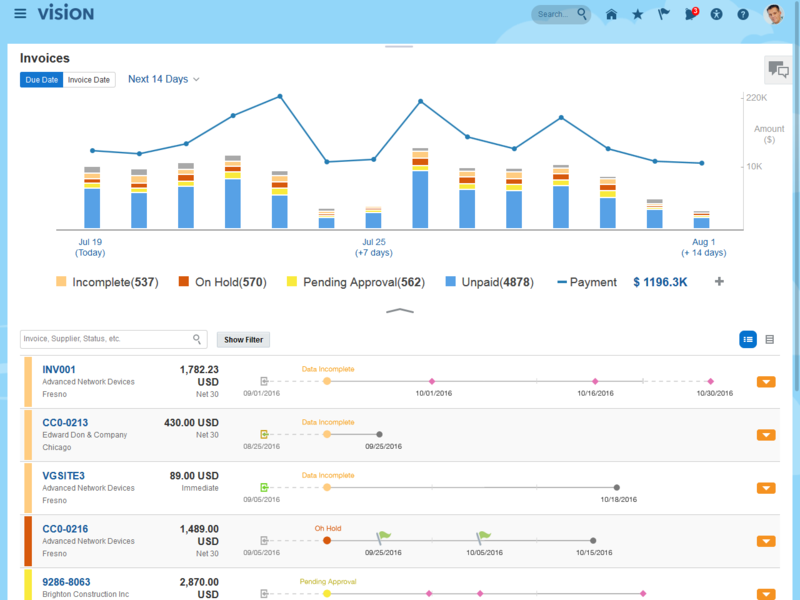 Oracle ERP Cloud Review: "A user’s view of procurement automation." We use Oracle Cloud’s procurement module for all of our buying needs across the company. It forces us to provide all the necessary info. This streamlines rework in the procurement cycle and ensures the PO gets created correctly the first time. All the inputs are on just a few screens. This makes the system easier to use and learn. The user interface is clean which makes the inputs understandable. There are many unused fields which clutter the screens. Those need to be suppressed. There are multiple unused screens. This is unnecessary. The search facility is weak. It is a good general purpose procurement system. Oracle ERP Cloud Review: "Oracle ERP"
We use Oracle for our entire accounting, finance and procurement department. It replaces our old on premise system (Great Plains). Good for a company who is looking for a cloud solution that is high growth and needs a system that is scalable. Oracle ERP Cloud Review: "General Ledger - AP and AR"
We have just started our journey on the Cloud with Finance and we are in the process for Planning, HCM and OTM and expenses in 2019 and procurement and inventory 2020. Excited about the final product at the end as we have all info flowing in one place and no need to work on multiple systems to address reports, sales, inventory and so foth. we are able to reduce some of our manual journal entries, automate bank reconciliation and looking forward to reduce more in the future of those manual journals. Bank reconciliation is great, when automated. Asset Keys are enable in the search engine even though you have the button on. all data is one place in the future and looking forward to that, reports i wish no breaks may be data dump to give the user the ability to do their searches and reviews. Oracle ERP Cloud Review: "Oracle is doing well"
I implement Oracle Cloud ERP for various clients. Depending on the module, the various modules will be used by our appropriate resources. Reports are typically not only leveraged by related departments, but by management in business operations and those responsible for making business decisions. The reporting typically has replaced a manual process that required resources to compile accounting data and distribute it. Users can now access ready-made reports that have real-time data and flexibility for reporting. The user interface could be updated. With a fast-changing web experience, the UI should stay current. More flexibility in environment management (shorter lead time for refreshes, shorter turn around time for environment provisioning and resizing, etc). Oracle ERP is great to modernize your back office suite of software. Over the last two years, Oracle has done a much better job of unifying their many previous platforms and software. The system used to look different and you could tell that they leveraged different software products, but it now looks much better to the end users and system administrators. Oracle ERP Cloud Review: "Oracle on the go!!!" Oracle ERP is being used by the Procurement and Legal teams. My company has been using On-prem Oracle ERP for the past 12 years. We have recently begun the journey to move to the cloud. We have implemented the Procurement Cloud and are in the process of reviewing financials and the PLM cloud. We have also started reviewing the maintenance cloud to see if it could provide better analytics than on-prem EAM. Oracle Sales Cloud and OTM cloud are other products that are considered among the well established Oracle Products. Since it has become a Saas model, the ERP cloud is difficult to customize and use as needed. We also need to work within the configurations available and adapt our business processes accordingly. I wish there were some options to customize the cloud to our requirements. The Procurement Cloud is very well developed for sourcing but procurement contracts are not user-friendly and have very little room for building additional attributes. User Review: "Oracle ERP Cloud: A Work In Progress"
So far we have rolled out Oracle ERP Cloud to two of our locations in Europe. We have quite a few subsidiaries throughout Europe—each of which have used their own ERP solution in the past. We are working to standardize the ERP system, so we will have a common application being used for all of them. The product has very clear responsibilities defined. The user interface is quite intuitive. The application is easy to navigate. There are frequent bugs our team has identified. We use Oracle's E-Business Suite in the US, and the flows and usability of the two applications is very different. There are quarterly updates to the application which result in a fair amount of changes requiring substantial testing efforts. The application itself has the potential to be a powerhouse. It can do almost anything you would expect of a full ERP system. The problem we've experienced is that the product offering is still relatively young in its development stage. By that I mean there are quite a few kinks which need to be worked out in order for it to be a smoothly operating tool. We use Oracle ERP Cloud for automotive distribution, warehouse management, accounting, and financial reporting. Cloud applications are used by approximately 400 users. Allows us to focus on our core competencies. Reliability and up-time needs to improve. We have experienced extreme slowness as well, which seems to correlate to patching activities. This causes significant disruption to our business operations. Well suited for companies looking to get out of managing IT and in need of a platform that will enable future growth. Oracle ERP Cloud Review: "Easy maintenance, low spend on staff and super easy upgrades"
Our finance and accounting departments are heavily relying on Oracle Cloud ERP. All employees use the system for Procurement and expense recording needs. Oracle ERP Cloud Review: "Modern BX"
Oracle ERP Cloud Review: "Customer Experience"
It will be used to drive efficiency and add value. Reducing on prem assets and having a more secure system will drive value. Additional functionality will include more efficient procurement activities with procure to pay. Punch out capabilities can also be used to save time. Procure to pay will be a big benefit. it will drive down cycle times. Oracle ERP Cloud Review: "Pretty time taking"
We use it for mainly for procurement for datacenter infra and to some extent for our hardware products procurement and supply chain. It is efficient at organizing data and giving quick reports. It is a well designed system. Though we had issues to implement, it went well after initial hiccups. Prototypes were good. User Review: "Oracle ERP Cloud: It's good"
Oracle Cloud is used in demand and supply planning as well as procurement departments. We are running on-prem Oracle applications for other business departments. We are planning to move other departments Oracle Cloud, especially in PLM area. Easy to roll out newer versions, most of the out of the box functionalities are useful to handle business cases. Organizations can adopt newer functionalities and newer working conditions and stay ahead of competitors. It is easy to customize and maintain Oracle Cloud. There is a scope for UX experience. Oracle cloud is well suited for minimizing organization IT infrastructure setup and maintenance. Used across the entire company. I currently used to support the purchasing and sourcing processes. cooler UI -- Sourcing, procurement, etc. It is well suited for both finance reporting and purchasing. Oracle ERP Cloud Review: "Oracle Fusion HCM"
Oracle Enterprise Resource Planning (ERP) Cloud aims to offer a complete, innovative, and proven cloud ERP solution for organizations of all sizes. Oracle ERP Cloud manages core business functions such as financial management, project portfolio management, procurement, risk management, and enterprise performance management (EPM) in a suite of connected SaaS applications. Oracle ERP Cloud consists of several cloud applications, including Financials, Procurement, Project Portfolio Management, Revenue Management, Risk Management, and EPM. Each module promises to improve productivity and controls across your business, providing lower costs. The suite aims to offer simplified financial management and increased collaboration through streamlined tools and embedded social capabilities, while a common general ledger increases business intelligence through deeper insights and data access. Oracle ERP Cloud promises the functionality, analytics, security and mobile capabilities needed to run your business today. 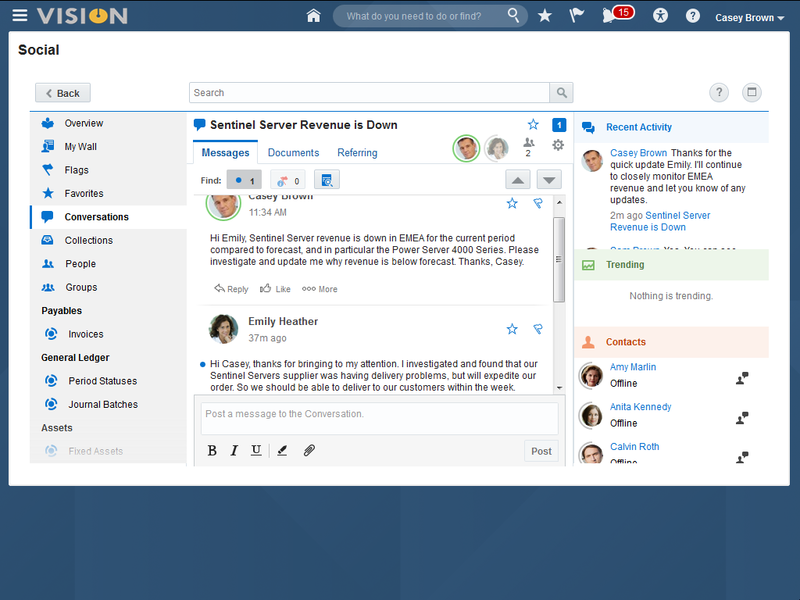 A simple, modern interface provides easy access to information across areas, personalized for each user.Critical information is available at a glance with comprehensive details a click away.Analytics provide insight to understand what is happening across your business today and to predict future events by analyzing trends.Social collaboration meets the modern communication needs of today's employees and breaks down barriers between teams. Pricing per user varies by component within the Oracle ERP Cloud solution. Please see pricing information for the ERP Cloud components on cloud.oracle.com or contact Oracle Sales at +1.800.633.0738.